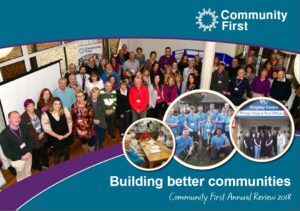 Community First is a registered Charity. We aim to be the difference that makes a difference in our local communities. Community led and people powered, we work across sectors with community members to affect positive change and be a force for good. We are an independent membership organisation with a diverse membership of over 600 member organisations. We believe that we are all stronger by working together. We welcome new members and their involvement in our work. Membership is free to voluntary and community organisations who operate in the areas that we serve. Inclusive – We value diversity and will strive to ensure that opportunities are open to everyone. We will actively seek to include those less likely or able to participate themselves and treat all our customers, partners and members with respect and courtesy. Evidence based – We will make reasoned and informed decisions through research and tested evidence. 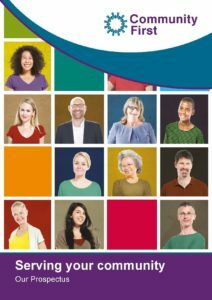 Our Prospectus and Annual Review are now available. We hope you find them of interest.